Jerry Brothers was founded in the early 1900s with a focus on servicing the conveyor belting needs of the booming tobacco industry in Richmond at the time. Over the years, the company diversified its offerings and eventually added an additional office to serve the manufacturing needs of the Charlotte, North Carolina region. Today, the company is a leader in lightweight conveyor belt distribution, providing solutions for bakery, cookie, meat, tobacco, printing, box, and distribution center customers. Helium was hired to give the company a fresh new look. 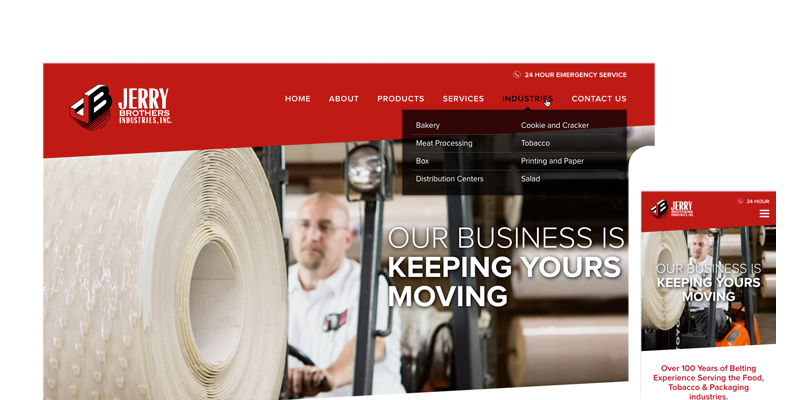 We reorganized the site with a focus on the industries that the company serves. Heavy focus was placed on product offerings and custom solutions.